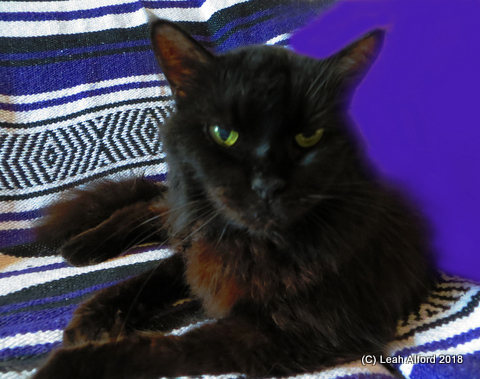 This entry was posted in black cats, Cat Topics, Cats, Feral Cats and tagged black cats, cat adoption, cats, feral cats. Bookmark the permalink. 68 Responses to Street Kitty Comes to Live With Us! Gosh, I missed this post, too. I understand about missing UV, it’s hard to get over. UV stays on my mind, I still miss her so much . . . the little guy is a help and gosh he’s so much bigger now than when I took these pictures, he may have been even younger than we thought! It’s great to have the little guy. UV likely did some whispering and planting ideas. A good result. You are so right, David, Franklin is a joy! I think Queen Ultraviolet is pleased. Congrats! New kitties are exciting and stir up the house a bit (like my Bunny 😉 ). I hope Franklin is settling in. Enjoy the holidays ahead! Franklin and I thank you Eliza! Franklin is like your Bunny, one of those kitties who revs things up! Big-time! I think he’ll settle when he matures a bit! I hear you! Franklin loves standing, sitting, and reclining on the kitchen counter. And knocking lightweight cups of water off of it! We say thank you and, meow! Both very sweet kitties. Franklin and I thank you, hobo hippie! Franklin and I thank you, Charlotte! Glad you’re feeding Daddy and Prissy! I’m sure Prissy could be getting fed elsewhere – we’ve known several cats who would make the rounds at several houses – but I’m sure you food you provide is also much needed by these cats who are out on their own. Franklin is indeed making himself right at home! I agree, he wasn’t out there long. I wish they could tell us exactly what their histories are! I imagine UV is looking over fondly from the Rainbow Bridge. Franklin and I thank you, cat9.984!! We are indeed very happy to have Franklin here, while still missing our girl. He’s a beauty. Glad he’s found a good home. Franklin and I thank you, Ellen! Thank you! He really is a sweetie! Budd came to us in August. He is a street kitty that wanted to live here. The vet says he’s about 4 or 5. Him and Tyebe are the best of buddies. Shoko is rather reserved around him. Think she’s a little scare because he is male but fixed and a big cat. Budd is starting to lose some weight…..I can only hope. Everyone must’ve been feeding him. Your little kitty will be a challenge. Jean, congratulations on also having a street kitty! Hopefully Shoko and Budd will eventually become more relaxed around each other. Our groups of cats usually did eventually but it took a long time. You are right, Franklin will be a challenge but I hope he will mellow out. In the past we’ve raised some pretty boisterous kittens and have taken in cats who were much more feral than he is. We found an all black one-month-old two Thanksgivings ago on our dirt road. We love her but she is a devil! Bottom teeth are so obvious on a black kitty! Congrats on your find. Yeah, he does look like a Siamese. Thanks, Lee! Congrats on your kitty too! Cats can be disruptive and strong-willed but I love their sweetness. Franklin is a still a little live wire guy, just a big kitten. And the more I look at him the more he reminds me of a Siamese. Franklin and thank you, FACE Foundation! I think his eyes are gorgeous, too. Looks like Franklin will be celebrating his first Christmas in a new home! How lucky is that?! I am sure you will be having lots of fun teaching him “the ropes”. We look forward to seeing more of him. Thank you Greg, Franklin’s presence is certainly a great Christmas present for us! I hope to post more pics of Franklin soon, they are in the camera but they may require some photo editing which I’ll need to make time for. Seems in my case photo editing takes the most time when it comes to the blog. True for me also! I actually enjoy working with pictures, but I have such limited time and energy these days. Well, enjoy! What a wonderful holiday gift — for you … and for Franklin. 🙂 More photos, more photos! Thank you Sharony, Franklin and I appreciate it! Yay. I am glad you rescued another cat. For me/to me, my heart will always be broken at the loss of my cat. They do that, pets . . . Thank you terrepruitt! I’m sorry you lost a kitty, I know how much it hurts. I stay brokenhearted about UV, and so many others. My kitty died in 2014! But my heart still hurts. It always will. Doncha think? They just do that. Right now one of our present kitties is talking to me. I have no idea what she is saying, but she is saying it LOUD! I understand and agree, I still miss kitties who left us long ago. I try to recall the good lives we had together. Present kitties and their insistent meowing, they are a help with grief. Congratulations on taking in another black kitty. They need homes so desperately. 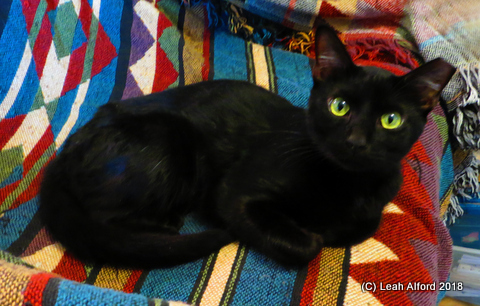 Franklin’s big green eyes are beautiful. 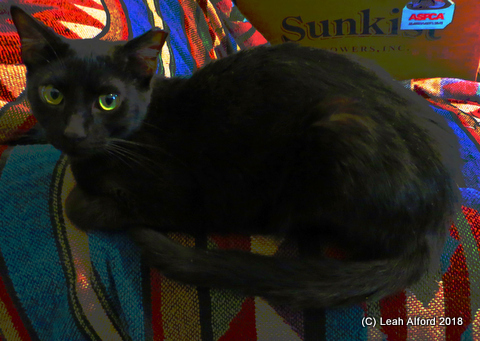 My youngest cat Roc is black and lanky with maybe a touch of Siamese as well, but his eyes are more yellow. He and Franklin may be cosmic cousins. Thanks catsworking!! I really do prefer the black kitties, I just think they are extra beautiful. Franklin’s eyes are looking a little greener in the pictures than they actually are, he too has eyes that are closer to gold, so he and your Roc may be related indeed! Congratulations, Leah and Franklin! My Tyler also has a tipped ear, and though he’s skittish, the big, affectionate boy is anything but feral. It really is hard to tell for the wonderful volunteers who do TNR. And being altered is a good idea, whether stray or feral. Oh, and PS- have fun living with a katten! Thanks Mollie! I too admire those doing TNR, and I know it’s hard to sort out true ferals from borderline friendlies – I think Franklin might actually be in the gray area between the two. Good for you taking in Tyler! I’ve even seen a few (uneartipped) cats who were definite ferals, do complete turnarounds in homes. Franklin’s definitely a big, bouncy kitten! Oh happy day, and even the same color as pretty UV! Franklin clearly has the loving gene, and the loveable gene! Congratulations on your pretty new kitty! I have no doubt this will be an enduring and loving alliance for all of you. Franklin rocks!! Thanks Lauren, Franklin and I appreciate your thoughts and enthusiasm! We are indeed very happy. Franklin is essentially a big kitten and I think he will grow into a fine and sweet cat. Thanks Cate, it’s a happy time for us for sure! Now I’m wondering just what Ultraviolet is telling Franklin, LOL and hmmmmmm. He’s beautiful! So happy for you all! Franklin and I thank you Susanne! It is a happy time! Hey you have Meezer in you?? Petcretary says wonderfur!! She too prefers the so called apple headed styled ones like all the meezers that have lived here, including me, Pipo. You sure are a handsome fella and were glad you were found and given a great new home to call forever! Thanks very much Pipo, Dalton, and Petcretary, from Franklin and me!! Pipo, you are quite the handsome meezer yourself! Congratulations on your new arrival, Catwoods! He is a sweetheart. Ultraviolet was a dear kitty. I feel for your loss. It will hurt a long time. Thank you so much Lavinia, Franklin and I thank you! And thanks also for your kind sympathy about Ultraviolet, we appreciate it. What a handsome lad! As soon as I saw the top photo and the size of his ears I decided he had some Oriental ancestry, so I felt very pleased with myself when I read that the vet had said the same. Franklin must be very happy to have found a home. Franklin and I thank you, toutparmoi! That was a sharp observation about the Oriental ancestry! I didn’t pick up on it myself but after the vet said that, it made sense. You can’t see very well in these pictures but his muzzle is long and slender also, much like the slim Siamese being bred nowadays. We are certainly happy with him and I hope he is with us, too! I have a very soft spot for Siamese cats, but I prefer the slightly more solid “old style” that Franklin resembles. He looks a lot like the very first Siamese I had many years ago. A lot of the modern ones are just a little too elongated in head and body for my tastes. I agree with you, I like the older Siamese – I’ve seen them called “apple-headed” – and I think they are breeding them just a little too thin these days. Omg look at him. So happy for you, Leah! Welcome home, Franklin. Franklin and I thank you, Lesley! We’re happy he’s here, too!